Both AT&T and Verizon have succeeded in building businesses handling data connections and electronic records for hospitals, but for the most part U.S. wireless carriers remain on the health-care sidelines. (Bloomberg) — Google and Apple Inc. have some bright ideas about the future of health care. Not so long ago, AT&T Inc. and Verizon Communications Inc. had similar ideas: a networked world of devices and services that would revolutionize how medicine is practiced in the U.S. and, in the process, tap into a huge new vein of business. So far, it hasn’t worked out that way for the telecom companies. Now comes the tech push. Google parent company Alphabet Inc. is developing wearable devices embedded with sensors, such as contact lens that monitors glucose levels. Apple supports developers of apps that track consumers’ health data, sharing the information directly with doctors. And dozens of startups such as Omada Health Inc., Doctor on Demand Inc. and Amwell are helping people lose weight and connect with other patients, coaches or doctors. Can these businesses succeed where the likes of Verizon and AT&T fell flat just a few years ago? Maybe. But the earlier telecom parry into U.S. telemedicine that flopped several years ago is worth remembering. Starting around 2009, telecommunications giants AT&T and Verizon, among others, made bold predictions about the future of telemedicine. By 2012, Verizon Chief Executive Officer Lowell McAdam said his company was “focused on enabling the transformation” of the health-care industry, backed up by the $10 billion the company spent over the past decade on fiber-optic networks, data centers and network security. But the health-care bet has yet to pan out. Both AT&T and Verizon have succeeded in building businesses handling data connections and electronic records for hospitals, but for the most part U.S. wireless carriers remain on the health-care sidelines. This has left medical and tech companies to pick up the bulk of growth in telehealth services and devices. And there’s a lot to pick up. A recent Harvard Medical School study of claims data found that Medicare patients’ use of teleconferences or virtual visits increased by 28 percent a year from 2004 to 2013, with 107,000 visits in 2013. The U.S. is the largest market for telemedicine, a $14.4 billion global business in 2015 which is projected to grow to $34 billion by 2020, according to Mordor Intelligence. Broadly defined, telemedicine is any exchange of medical information via electronic communications, including two-way video and remote monitoring of patient health. 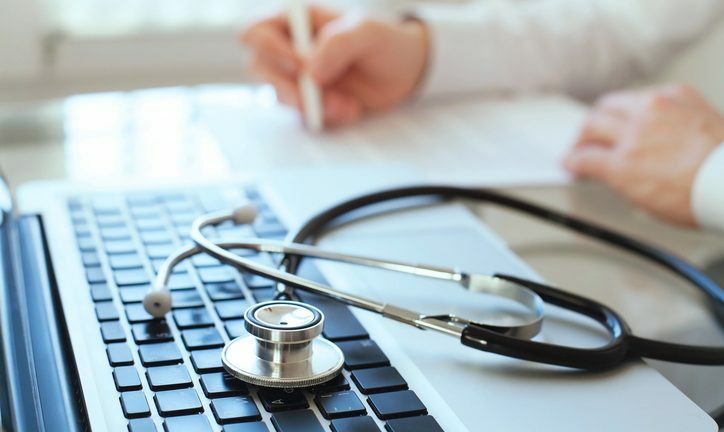 AT&T and Verizon pull in only “tens of millions” or “a rounding error” of telemedicine, according to Roger Entner, an analyst at Recon Analytics LLC. Two smaller U.S. carriers — Sprint Corp. and T-Mobile US Inc. — play even more limited roles in telehealth. Verizon and AT&T targeted health care as a growth market as early as 2009. It made perfect sense: with growth of their cellular businesses slowing down, big telcos seemed well poised to find new revenue providing secure networks for the medical community to exchange information and provide health-care data storage and other services. Verizon, especially, with its continent-spanning wireless network and fiber-optic infrastructure, seemed the perfect go-to telco to handle the burgeoning markets for electronic health records, clinical collaboration and hospitals’ ever-growing data use. The telcos, though, never figured out the killer apps that the health-care industry was looking for — how to smoothly connect patients with the doctors and labs seeking to retrieve and view data in real time from patient devices. Hospitals and doctors didn’t just need networks; they were looking for innovative services and devices that could make their lives easier, said Mass General’s Schwamm. AT&T developed slippers outfitted with sensors so medical staff can wirelessly monitor how patients are walking or if a patient is stumbling so a caregiver can be alerted. The carrier also offered connected pill bottle caps that can blink lights and sound chimes to remind patients to take medicine. The devices demonstrate technological capability but have yet to gain much of a following. Then Verizon introduced its Virtual Visits in 2014, a package of video cameras, computers, software and data connections all aimed at getting patients and doctors together in teleconferences. The telco giant was competing against smaller, more focused companies, such as MDLive Inc. and American Well Corp., that were more nimble at telemedicine. After less than a year of disappointing sales, Verizon shut it down. “If Verizon’s stated intention was to be a leader in this field, then they have failed,” said Mass General’s Schwamm. Verizon and AT&T’s frustrated efforts to penetrate health care are in stark contrast to some telcos’ experiences in other countries. Telus Corp., Canada’s third-largest telecom company, entered the health-care business almost a decade earlier than its U.S. counterparts, spending C$2.6 billion ($2.01 billion) since 2000 acquiring such companies as Emergis Inc. and Medesync, which build electronic medical record systems. Today, Telus’s health businesses bring in about C$600 million in annual revenue. The company says the business is profitable and on par with the 29 percent profit margin of its overall landline business. Its early entry to the market meant that Telus was able to build its business with less competition than U.S. companies have faced from other industries angling to get a piece of the business, according to Paul Lepage, president of Telus Health. The U.S. market is dominated by non-telecom companies like pharmacy chain CVS Health Corp., which runs its own pharmacy management software, or insurance providers that are beginning to offer health-care services themselves, he said. “From our perspective, starting from the CEO and working its way down the organization, everybody understands the importance of health,’’ he said. AT&T, for example, is working on a networked wheelchair that provides real-time diagnostics to monitor battery life, location and tire pressure. A sensor will alert health-care workers when the wheelchair tips over, and the tires can inflate if needed. Verizon has also taken on the role of technology consultant and supplier to health-care agencies. Visiting Nurse Service of New York, an independent, not-for-profit home health-care organization, for instance, hired Verizon to redesign its information systems with the goal of lowering costs and making technology easier to use. “They now have 3,000 nurses carrying tablets and even wireless cameras for wound care that lets them transmit directly into their system and connect to health-care providers,” Green said.